How does foaming hand soap really work? Soap is one of those things that you don’t notice until you run out of it. There you are with greasy fingers after buffalo chicken wing night, and your hand soap dispenser is coming up empty. A real drag. Advancements in soap technology, specifically foaming hand soaps, are making soap a more noticeable commodity, however. Soap has evolved from its ubiquitous bar form to liquid and foam options. Liquid soap wasn’t marketed until the 1970s, and foaming soap has only recently become popular. Public restrooms and business restrooms around the world now rely almost exclusively on liquid soap options because of their relative cleanliness, sustainability, ease of use, and cost-effectiveness. So if liquid soap was such an improvement, why the need for foaming hand soap, and how does foaming hand soap really work? Truth be told, foaming hand soap is a form of liquid soap. It is derived from a diluted form of liquid soap that is infused with air to create a foamy lather as it leaves the dispenser. Specialized dispensers are required to use foaming hand soap properly. Some are designed for use without refilling, and others (permanent dispenser in public restrooms and businesses) are refilled regularly. Some soap is kept in a pressurized container, and some is mixed with air in the dispensing unit when the pump is activated. A pump-style dispenser has two chambers. One chamber holds soap and one pumps air into the dispensing unit when the pump is depressed. Pressurized dispensers are usually automatic and activated by placing hands directly underneath them. When the pump operates, the pressurized soap is released from its container in a measured amount. These types of dispensers aren’t refilled by adding more soap, but are refilled with a sealed packet or cartridge of pressurized soap. Foaming hand soap is considered to be easy on the environment, affordable, efficient, hygienic, and an all-around sustainable option. There’s no doubt that it has grown rapidly in popularity over the last five to ten years. Manufacturers benefit from having to produce less soap per sale, and consumers benefit from having to buy less soap, packaging, and transportation per unit. Environmentally friendly. 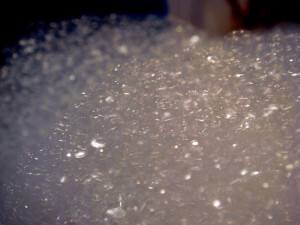 Foaming hand soap is firing on all cylinders when it comes to being easy on the environment. Because it is a diluted form of liquid hand soap, less soap is used per hand washing session. It is also thinner and less likely to clog drains, which people often use harsh chemicals and detergents to resolve. When less soap gets rinsed down the drain, less soap ends up in the environment. Another less obvious environmental benefit is the conservation of water. Industry studies have revealed that people who wash their hands with foaming hand soap use 16 percent less water to lather and rinse their hands than those who used regular liquid soap. The same studies suggest that foaming hand soap can be used to lather without wetting the hands and water need only be used to rinse the soap away, which can reduce water usage during hand washing by up to 45 percent. Foam soap doesn’t rely on chemicals to create lather, either. Forced air causes natural lathering, which helps foaming soap biodegrade faster than traditional liquid soap. Additionally, you can get more hand washes per package with foaming soap, reducing packaging and transportation impacts on the environment. Cost-effective. Wasting less soap means buying less soap. Foaming soap dispensers release less soap than regular liquid soap dispensers do, allowing users to achieve the same level of cleanliness with less soap. Less soap per hand wash makes the same amount last longer, which costs less. Manufacturers also need to make less soap per unit they sell. Consumers save by having to pay for less packaging and transportation, in addition to the benefit of having to use less product per hand wash. Sustainable. Foaming hand soap is environmentally friendly, but it is also sustainable in a larger context. By reducing the amount of emissions required to transport it, reducing the amount of packaging needed to distribute it, requiring less of it to be used per hand wash, and by using less water to rinse it away, foaming hand soap is a more financially and environmentally stable product. As an additional bonus, foaming soap dispensers need to be refilled less often, saving both time and money. Several studies have also linked foaming hand soap used in tandem with automatic dispensers to reduce infection in work spaces and improve the health of employees that use it. Measured amount for proper hygiene. Because foaming hand soap lathers more easily, less of it is required to achieve an acceptable level of hand hygiene. Consumer surveys have also consistently revealed that hand washing is easier with foaming hand soap than with liquid soap. Foaming soap maintains this advantage because it is dispensed in a ready-to-lather form. Less of it is needed to fully cover hands in lather. Less of it is wasted and washed down the drain, as well. There’s no doubt that foaming hand soap is giving solid form and liquid hand soaps a run for their money. The longterm benefits of soap that requires less chemicals to manufacture, is hands down easier on the environment, and saves money for both the manufacturer and the consumer are hard to ignore. Next Next post: What is drilling detergent and how can it save your company money?